DANVILLE, Kentucky -- The 2012 Vice Presidential Debate is scheduled for Thursday, October 11 at Centre College in Danville, Kentucky from 9:00 p.m. to 10:30 p.m. Eastern Daylight Time (8 p.m. Central Time / 6 p.m. Pacific Time) between Vice President Joe Biden (D) and Congressman Paul Ryan (R). The 2012 Vice Presidential Debate is scheduled to last for 90 minutes. The 2012 Vice Presidential Debate live stream online will appear here 10 minutes before the debate begins Thursday. 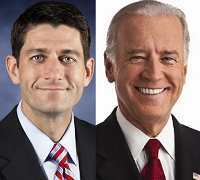 The 2012 Vice Presidential Debate will air on PBS, NBC, CBS, ABC, FOX, CNN, and C-SPAN on television. Viewers can also watch the only Vice Presidential Debate live online on YouTube, AOL, major network, and some network affiliate websites from 9:00 p.m. to 10:30 p.m. Eastern Time. The Biden Ryan Debate will cover both foreign and domestic topics and be divided into nine time segments of approximately 10 minutes each.